Don’t let the glistening high-rises, manicured lawns, and ever present construction fool you: Tampa, host of ASEE’s 2019 Annual Conference and Exposition, is an old soul with roots as deep and spreading as the mangroves that line its shores. The city began as Fort Brooke, a small outpost of four U.S. Army companies, a couple of months after the first U.S. settlers arrived in Florida in 1824. They wanted to protect the bay, which was viewed as a potential resource for industry and trade after Spain transferred control of the territory in 1821. The city was incorporated in 1849, growing slowly until the 1880s. Tampa exploded as an urban center with the building of a railroad and a hotel—as simple as that. Henry B. Plant, a tycoon from Connecticut, ran the national railroad to Tampa in 1884, a year after valuable phosphate deposits were found. To cement the destination that he had created, he built the luxurious Tampa Bay Hotel, which opened in 1891. The opulent 511-room castle held treasures from across the world and sported the most modern of comforts—every room had telephones and electricity; many even had private baths! The castle still stands, its stainless-steel-plated domes and minarets shining across the Hillsborough River from the Convention Center. It now holds the University of Tampa, a top-notch school known for its liberal arts programs, and a museum dedicated to Henry B. Plant containing many of the original furnishings. A ticket with a self-guided audio tour will run you $10 for adults and $7 for seniors and students. Navigating in Tampa can be a little challenging. There are lots of one-way streets and big highways, and many of the downtown restaurants are spread out from the Convention Center. A number of things make up for these inconveniences, however. The Tampa Riverwalk is a 2.4 mile-long pedestrian pathway that traces the Hillsborough River area of downtown Tampa, linking many hotels, restaurants, and museums in one easy path. The Riverwalk runs right in front of the Convention Center and is the easiest—and most scenic—walkway to many downtown destinations. Along the walk, you’ll find placards discussing everything from Tampa’s aeronautical history (site of the first commercial flight) to its local flora, like the shady mangroves keeping the shores in check. As you walk beside the river, you’ll see yellow boats trundling along the middle, sometimes dipping to one side or the other to pick up passengers at designated yellow signage points. These are the Pirate Water Taxis, and they’re the best way to get up and down the river—or to the other side—if you don’t feel like walking. It’s a little pricey: $20 for a full-day hop-on, hop-off pass. But the atmosphere is worth it: You’ll glide along to the sound of classic rock, taking in views of the whole downtown. The boats also serve beer and wine. If your boat captain is in a good mood, he might give you a quick-and-dirty Tampa historical tour “that is decidedly not Visit Tampa Bay approved!” says Kevin Wiatrowski, Visit Tampa Bay’s media relations manager. The tour is, nevertheless, likely to be entertaining. If you want to catch the water taxi—popular with kids—stand by one of the yellow signs on the river and wave it down as it passes. Beware, though—some people rent out the boats for charter tours, and these boats will ignore you. The Pirate Water Taxi app or schedule will tell you when the real deal is on the way. While the water taxi is the best way to get to downtown locations, the trolley is the best way to get between neighborhoods—especially if you’re heading northeast to historic Ybor City. The yellow-and-red TECO streetcar is free and has multiple stops running north-south from downtown to Ybor City and back. They run every 20 minutes and are a stress- and money-free way to tour the area. Maps and schedules can be found at www.tecolinestreetcar.org. There are other streetcars run by the Hillsborough Transportation Authority that run to more neighborhoods, including west across the river to the University of Tampa and Hyde Park Village. These are $2.00 each—still cheaper than the water taxi! Ybor City is named after Vicente Martinez-Ybor and his family, who came to Tampa in 1885, lured by the shiny new railroad line, humid weather, and fresh water. His family was in the cigar business, bringing hundreds of Cuban workers from Havana to Key West to roll their cigars, and then on to Tampa to set up cigar factories. In its heyday at the start of the 20th century, Ybor City was the cigar capital of the world, producing hundreds of millions of cigars each year. The industry’s golden age ended with the Great Depression; however, you can still buy local hand-rolled Ybor cigars throughout the city. The area remains rich with Cuban and Spanish culture. The ties to Cuba here are felt throughout the neighborhood. La Segunda Central Bakery is located here, and it’s the country’s largest producer of authentic Cuban bread. If you eat a Cuban sandwich anywhere in the United States, you’re likely eating crispy-soft La Segunda Cuban Bread. In Tampa, it’s likely to accompany any Cuban-inspired dish. Some years ago, there was a friendly contest between Tampa’s and Miami’s tourism services to decide which city made the most “authentic” Cuban sandwich. Tampa won when it turned out that Miami was importing its bread from La Segunda. Ybor City, which is directly north of downtown Tampa, has a distinctly Wild West feel about it. Chickens and roosters roam freely. The Spanish brick stores and sidewalks boast tile mosaics depicting scenes from Don Quixote, particularly outside the landmark building that houses the Columbia restaurant. The largest Spanish restaurant in the world, the Columbia is 114 years old and has been run by the same family for five generations. It is regal as well as enormous. Originally a saloon, it was expanded by the Hernandez family during Prohibition and transformed into a family-friendly eatery. Go there for authentic Spanish wine, sangria, and tapas. Throughout the neighborhood, once considered somewhat seedy, you’ll see signs of revitalization. Students will be attracted to its young vibe. It’s home to funky local artist shops like Dysfunctional Grace, a family-run store full of creepy, taxidermy-inspired art. There is also Blind Tiger Cafe, a coffee shop “speakeasy” that serves unique brews and kombucha on tap. At night, this is a great area for bar hopping. More than anything, it’s known for the Castle nightclub, a world-famous goth club that welcomes anyone of an “alternative” lifestyle. The Castle recently celebrated its 25th anniversary. Downtown Tampa has something for everyone. 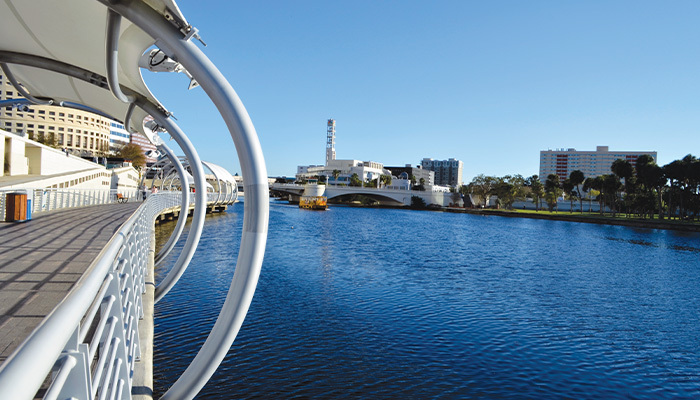 For those seeking a break from technical sessions, take a stroll north of the Convention Center along the Riverwalk to the Tampa Museum of Art. The edifice is impossible to miss. A giant rectangular mushroom lit from all angles, it includes an alcove overlooking the Hillsborough River with a giant Venus statue. The museum itself is small but packs a punch. It’s best known for its permanent collection of classic Greek and Roman antiquities and modern art that plays off classic motifs. In the summer, this will include an exhibit called “Tableau and Transformation,” a photo display that features 20th-century takes on ancient works. The museum attracts high-profile traveling exhibits as well, like the upcoming “Abstract Expressionism” show that runs through August 11 and will feature paintings from Willem de Kooning and his contemporaries. If you’re less in the mood for art and more in the mood for shopping and lounging, Oxford Exchange is an all-in-one shopping and dining experience around the corner from the University of Tampa. It has a restaurant, bookshop, wine bar, local artisan shop, and tea bar all cozily housed in one mansion. The most surprising thing about Oxford Exchange is the vast luxury that lies behind its unassuming white brick exterior. This former horse stable, originally built in 1891, pleases the senses with an unmistakable old-bookshop smell, fragrant teas, and a tinkling interior fountain. The food is simple but exquisite. Breakfast toast comes with a house-made berry compote that will make you lick the ramekin. Comfort comes in the form of pumpkin babka (a traditional Jewish sweet breakfast loaf that could just as easily be eaten for dessert) and a side of sweet maple cream. On the lighter side, they offer a kale egg-white scramble that is a welcome change from many traditional breakfast foods. TeBella Tea Company is the local tea shop selling dozens of loose-leaf teas out of giant tins. You can buy a pot of tea in-house, or you can take a bag of tea to brew at home—though it’s easy to get lost in the sheer number of choices. Their specialty is called a Lavender Fog, brewed with their Earl Grey Lavender tea, rock sugar, fresh cream, and a dash of fresh vanilla, harkening back to the classic British London Fog concoction. TeBella’s flagship location, on Davis Islands, just south of the Convention Center, sells some 115 different types of tea. “That place is overwhelming!” says Jessica Frank, a TeBella drink maker. For some unconventional exercise and an adventurous way to see the city, the docks at the base of the Tampa Marriott Waterside hotel (next door to the Convention Center) will keep you occupied with stand-up paddleboards (SUP), paddle boats, and kayak rentals through Tampa Bay SUP. Tampa Bay Water Bike Co. offers single or tandem water bikes and “biyaks” in the same area. All are fun for kids and great ways to enjoy the Florida sun and water in an hour or two between sessions. Wherever you land in the Thomas Edison vs. Nicola Tesla debate, there’s no denying that Edison made a mark on the city. Edison was a resident of Fort Myers, Fla., about 125 miles south of Tampa, where his home and lab are open to visitors; he and his wife stayed at the Tampa Bay Hotel in 1900. The Edison: Food+Drink Lab restaurant pays homage to the inventor by coming up with new epicurean innovations daily. Run by chef Jeannie Pierola, a James Beard Award nominee, it offers such out-there fusions as Seoul poutine (fries, gravy, and cheese curds with pork belly kimchi), maple-glazed pork porterhouse (with pumpkin mole), or, for dessert, the “buzzed goat” (honey and goat-cheese cheesecake, sugared plums, bee pollen, granola crunch, and moscato d’asti sorbet). Throw in some potionlike cocktails, such as the Sneaky Pete (duck-fat-washed Eagle Rare bourbon, lapsang souchong syrup, and orange bitters), and you have a truly novel meal. If you want to sample some of the fare but avoid the Michelin-star prices, Edison now has an outpost called the Swigamajig at the recently opened Sparkman Wharf. The wharf is named after Stephen Sparkman, the politician and entrepreneur who secured federal funding after the Spanish-American War to dig ship channels in Tampa Bay. The channels led to what is now Florida’s largest port. Sparkman Wharf, which started out as a simple dock, has now become a destination for dining, drinking, and diversion. Its food court, built from stacked shipping containers, features high-end restaurants-in-boxes like the Boat Run Oyster Company, a portable oyster cart and farm-to-table restaurant run by two former spear fishermen. They pull their oysters straight from the brackish Suwannee River tide in Cedar Key and shuck them fresh at Sparkman Wharf and the Tampa market. Eat them raw on the half-shell or baked with ingredients like blue cheese and bread crumbs. BT in a Box offers French-Vietnamese fusion cuisine made with fresh local ingredients by chef B.T. Nguyen, who came to America as a refugee when Saigon fell in 1975. Her creative takes on classic banh mi sandwiches and chicken curry noodles can also be found around Tampa in various forms at Restaurant BT, Bistro BT, and BT To Go. The best part about the wharf is that it’s completely open. You and your friends can sample from each of the eateries, grab a Florida craft beer from one of 30 on tap at the Fermented Reality Biergarten, wander into Splitsville for a round of bowling, and finish it all off with a handcrafted ice pop or waffle-on-a-stick from Whatever Pops & Bowls in front of a giant outdoor movie screen. Aside from the wharf, Tampa abounds with tasty places to eat. Urban Cantina is about a half-mile north of the Convention Center and well worth the walk. Its rough-and-tumble vibe, dark windows, and luchador wrestler motif may try to hide it, but this place truly has amazing Mexican food at reasonable prices. Everything from the fresh guacamole and tacos to the sizzling fajitas will make your head swim. Anise Global, upriver from the Convention Center, is a swanky looking gastrobar that started its life as a food truck. Its “stinky bunz” are what put the place on the map. These small Asian-inspired buns are fragrant in a very good way (so-called stinky because of the way the cabbage smells when prepped) and come in a multitude of flavors, from crispy duck confit to red curry crispy chicken. The pub serves more substantial food as well, including large warm bowls of mouth-watering pork belly ramen topped with pink-swirled fish cakes and kimchi. Harbour Island, one of two small islands in Hillsborough Bay, used to be a site for dumping railroad refuse. It has since been cleared out and reborn as a place to park a boat, hang out, and eat. Among the biggest and most popular places to finish the day is American Social. This is a gargantuan indoor-outdoor tiki bar and restaurant with a patriotic motif and lots of beer on tap. The food is big, too, with huge hot wings and burgers with quarter-inch, thick-cut bacon. Hyde Park Village is located east of downtown, across the river. You can get there by streetcar. This quaint little neighborhood is great for wandering, shopping, and eating. The compound resembles a small town square and houses a mix of high-end retailers, small fashion boutiques, and local artisan shops. Right next to Anthropologie and Pottery Barn, you’ll find the Hawaiian Soap & Trading Co., filled with exotic scents and exploding with color from its dozens of craft soaps and tropical paintings. There’s also Albisia’s Jewelry, a shop that deals only with local metalsmiths and unique pieces. Armature Works, like Sparkman Wharf, is another upscale food court in the Tampa Heights neighborhood. The restored warehouse is filled with local restaurants, wine bars, a public market, and a trendy coworking space in a relaxed atmosphere. With such stalls as Ava Wood Fired Pizza, Cru Cellars Wine Bar & Kitchen, and Astro Ice Cream Co. (custom made with billowing clouds of liquid nitrogen), there is something for everyone to eat. Armature Works is conveniently located directly on the Hillsborough River with its own Pirate Water Taxi stop. At the Lower Hillsborough Wilderness Preserve, 20 miles north of Tampa, you can canoe the Hillsborough River for miles on end, solo or with a guide, through Canoe Escape. It’s a wonderfully wild wetlands experience. “On any given trip, you can see from 15 to 50 gators year-round,” says General Manager Michael Steven Cole, a seven-year veteran canoe guide. For those bothered by mosquitoes, he emphasizes that you’re safe in the boat. “Even in the summer on the water, the bugs aren’t bad because they don’t like the moving water. If you go back in the woods, though, you’ll lose a pint of blood.” This area is important because it’s the Hillsborough watershed—and the river supplies 80 percent of Tampa’s drinking water. It’s a haven for water birds like egrets, herons, ospreys, pink spoonbills, anhingas, and more. In addition, you’re likely to see red shouldered hawks, turkey vultures, and turtles galore. “This unique opportunity will most likely leave an everlasting impression of what the real Florida looks like untouched by man,” Cole says. Another short drive northwest is the Big Cat Rescue. This sanctuary is not a zoo but a place where abused exotic cats come when they are rescued from illegal circuses, cub petting zoos, exploitative breeders, or owners of exotic pets who realized they had gotten in over their heads. “It’s more like a retirement community,” says guide Angie Gabor. The cats have large pens where they can roam and frolic. Guides give tours at least once daily—during feeding times, if you’re lucky. As you wander the park, an audio tour will give you each of the cats’ stories. They are often heartbreaking, like the tale of Nikita, a lioness who had never felt grass beneath her feet, having been chained to the basement wall of a crack house her entire life. Her legs and joints were so swollen from the hard surfaces that she could barely walk. The Big Cat Rescue and Canoe Escape are only reachable by car. A Lyft or Uber ride costs about $25 each way from the Convention Center.